If you’re ready for the baseball season to start, you’ll love the free preview of MLB Extra Innings. It’s confirmed that DISH customers will have the first week of Extra Innings for free starting today and going to April 5. DIRECTV hasn’t published anything about a free preview yet but they were a little slow to promote it last year as well. If you have DISH, the MLB Extra Innings package is on channels 545-563, while on DIRECTV you’ll find them in the 700s. If you’re a baseball fan, you’ll love watching every out-of-market game from every team. There are literally thousands of broadcasts, making this the best value of any of the sports packages. Plus, you’ll get the MLB.TV Premium streaming package for free. If you bought this separately you would pay almost as much as you pay for Extra Innings, and you wouldn’t get the games live on DIRECTV. With Extra Innings you get every out-of-market game. This is perfect for the displaced fan because you can follow your team all around the country and watch the home team broadcast, complete with commercials that will make you wish you were back in the old neighborhood. With an AT&T phone you can stream DIRECTV content without affecting your data cap. All the video you want, all day and all night, from anywhere in the US. (This doesn’t apply to MLB.TV which does apply to your data plan.) Use the MLB At Bat app on your mobile device or the MLB.TV app on, well, basically any other device including PCs, Macs, smart TVs, streaming boxes, the list goes on and on. It’s practically impossible to find a device that doesn’t support MLB.TV. It’s only fair to point out that this package doesn’t exempt you from blackout rules. Those rules don’t make sense today, but they still exist. Generally a local game will be blacked out anywhere that “they think” is your local market. In some cases it’s a bit ridiculous — Las Vegans, I know you don’t think of yourselves as being in the same market as Southern California but the league thinks you are. The MLB.TV package carries the same blackout rules unfortunately. I’m not going to say you can’t fool it with a VPN, I’m just saying that you probably shouldn’t, if you are one of those people who likes to live within the law. Also, I tried this last year, you can’t activate MLB.TV during the free preview period unless you actually bought Extra Innings. Kind of a bummer but it’s pretty clear why they did that. 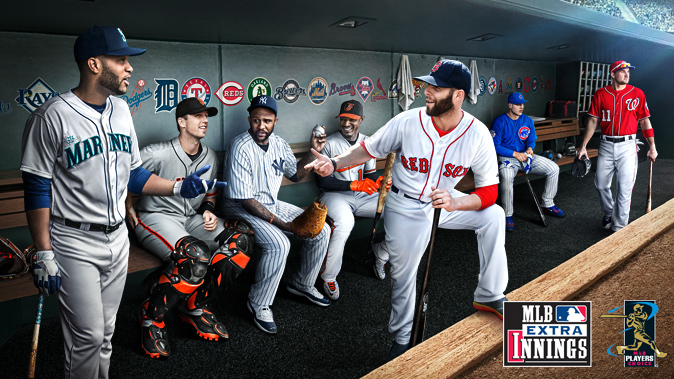 The first week of MLB Extra Innings is free on DISH. As I said, it’s probably free on DIRECTV too but they haven’t officially made it public. If you like what you see — the Strike Zone Channel, all the live games from either home team channel, the audio options and many other benefits of the MLB At Bat app, you can sign up for Extra Innings at your provider’s web site or by calling Solid Signal at 877.312.4547. If you own a bar or restaurant you’re probably already signed up for Extra Innings but if you’re not, our commercial reps can help you get set up at 866.726.4182. Why wait for the preview to be over? The price is the same so you may as well sign up now!